Woke at 7:30 and hung around giving the car its last touching up so she is in 1st class order now. After dinner, I wrote some more till 3, then we left for our first real night trip. We had 21 camions carrying lumber for new artillery bases. This night we were about 1/2 mile from the trenches and the star shells breaking over them made everything daylight for about 45 or 60 seconds. However, the night was extremely calm and altho' we expected to see a lot, all we enjoyed was waiting for an almost endless chain of autos and carts to empty their priceless war materials till we could discharge our load. We got back at 2:30 A. M. but I slept most of the way home even if the bumps did make me crack my head. Well anyway, we got home with very few "pannes" or accidents, or engine trouble. I rode with Ab Street on #9 last night and he being an almost expert mechanic, is what we call "ser file", or file closer. We go 9 cars to a ram, and as we closed the file for the first ram we have to stop and help repair any of the 8 cars in front of us that fall out of the convoy for any trouble whatsoever. Well, when I got home, I found a letter from Wilda and your package, so we had a feed of chocolates and cigarettes. Then, I crawled into bed at 3 A. M. with the first pajamas I'd had on since the hospital and at that they weren't mine. I received everything O. K. in the pakcage [sic] and it hadn't even been opened or touched. Believe me, it was better than a Christmas present. Well, folks, you can't imagine how I appreciate your kindness in sending the package and it sure was welcome. Please give everyone a hug and kiss for me, Mother, for my only reward at present in appreciation of all your love." "September 17, 1917. Monday, Fair. Chipman repairing one of the supply trucks. Today is Wilda's [one of Chipman's sisters] birthday, I believe, and how I wish I could send her a letter and a present, but the present she can get when I get home. No orders today but I went down to the atelier's [machine shop] this morning and had the magneto fixed which we are not allowed to touch. I spent all morning there and got the boat (#8) in perfect order and after dinner I worked on it some more so she ought to run in anything now. After supper I tried to get up on my correspondence but without much success as at 9 P. M. I had to guard till 12. Ab Street [Dartmouth class of 1918] came down and talked with me till 10:30 and at 11 I had to take some orders down to the captain and incidentally I had a talk with him. I came back at 11:45 with orders for the chef to go out tomorrow, and at 12 I woke Baldrich who took 12 to 3. Then I turned in. Somehow I was extremely happy tonight,--peaceful anyway. The war seemed not to exist." A War to End All Wars: "Necessary, Just & Righteous"
Edward C. Kirkland, Class of 1916, was an intellectual through and though. At Dartmouth, he was in the first honor group and a member of Phi Beta Kappa. After graduating in the spring of 1916, Kirkland enrolled in a PhD program in economic history at Harvard. 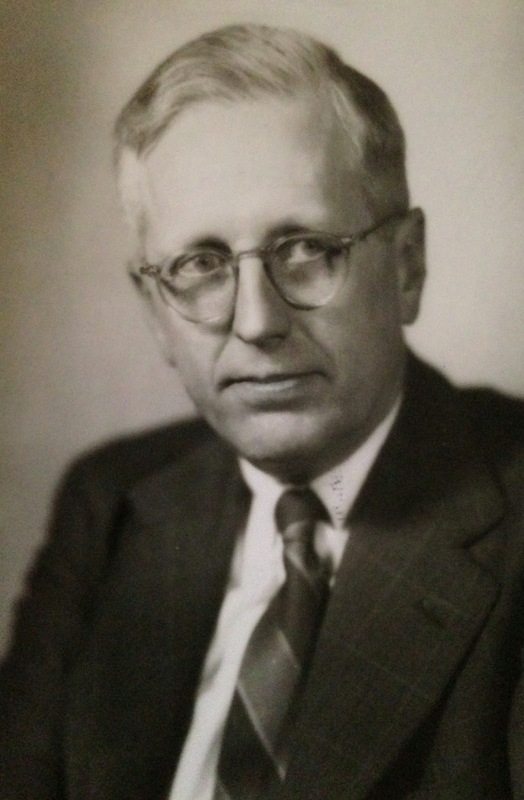 When America declared war, despite opposing military solutions to the conflict, Kirkland shelved his PhD studies and volunteered for the Harvard Ambulance Corps on June 2, 1917. Now that Americans were involved, Kirkland felt a duty to act and believed that volunteering quickly would relieve his conscience from “fretting, worrying, and doubting.” Kirkland’s parents had difficulty accepting his decision to volunteer, but Kirkland was thereby able to select the Ambulance Corps. One soldier pithily summarized the advantages of volunteering, “You can pick any branch you want now, later they pick you.” Still, only 28% of Americans who fought in World War I volunteered, while 72% waited for their service to be conscripted. After volunteering, Kirkland was sent to a training camp in Allentown, Pennsylvania. Kirkland left Boston amidst a crowd of crying mothers and waving American flags but considered the talk of heroics unjustified. To Kirkland, his role in the war was practical, but not valiant. At camp he reported that after being paraded around town he felt like “such a superficial hero.” Otherwise he adjusted well to military camp life. He joked to his mother in a letter, “I thank my bringing up for many things, but just now for the ability to eat everything.” During the Harvard section’s week on kitchen service, Kirkland and a friend were placed on butter duty. In his letters Kirkland hilariously recounted the challenges of mixing 300 pounds of oleo margarine with yellow coloring every day for a week. After spending more than two months training, Kirkland arrived in France on August 21, 1917. Like George Dock, Class of 1916, Kirkland was first stationed at Bar-Le-Duc. In October, he moved to La Grange aux Bois in the Argonne. During the war, he was also stationed in Haudainville, near the Verdun front, and in the Chateau-Thierry Sector during the allied offensive of August 1918. Kirkland seemed content with his noncombat role. He downplayed the risks of his position by joking that helmets were very handy for preventing bumping one’s head and regretted that gas masks were not necessary in his region because they gave one “a snappy appearance.” In November 1917 all of Kirkland’s ambulance work was ferrying the wounded to hospitals behind the line, so he could easily pen these jokes to comfort his anxious family. During the winter of 1917-1918, though, he was stationed close to Verdun’s front line, and he admitted to feeling more vulnerable. He was disturbed by the cries of the wounded in his ambulance, but comforted himself with the thought that “if the [wounded] are making a racket they are probably not intending to die on you.” On one mission Kirkland was hit by a gas bombardment while driving up a very steep hill near the front. He could not stop because of the grade of the hill, but his gas mask was stuck between the seats out of reach. His nose smarted as he drove, and he started to cough, but the gas cleared by the time they reached the top. He received a Croix de Guerre for his bravery. Kirkland acknowledged that the “Croix de Guerre may be as common as Phi Beta Kappa keys in Cambridge, but still I am happy.” Within his ambulance unit, Kirkland found a group of like minded men. His compatriots nicknamed the group “the intellectuals.” In their unit the group established a renting library and offered books for 50 cents a week. The proceeds went towards the purchase of new volumes. Kirkland and two others also wrote a newspaper for their unit called, Every Little Detail. Kirkland comforted himself throughout the war with these intellectual pursuits, but at the end of the war, the joy of the Armistice was coupled with the distressing news of the death of his good Dartmouth friend, Harold Bridgman Stedman, Class of 1916, who contracted influenza and died in a training camp at Fort Slocum, New York. Reminded so recently of the human costs of war, Kirkland greeted the news of the Armistice with an increased determination that the peace should be a righteous one that would “purge our minds of prejudices and hate.” Though most of the allied countries held the Germans in contempt and called them “Brute, Barbarians, and Huns,” Kirkland believed that their sins were sins of the mind that could be remedied through education, not sins of the heart. Kirkland, who at the beginning of the war disapproved of the conflict and saw it as the result of irresponsible militarist governments, admitted, “I have changed my view, you see, since I entered the army. The war was necessary and just and righteous in order to overthrow a pernicious philosophy, the philosophy of brute force.” Kirkland believed that the war could usher in a new era of peace, or at least a time where war would be less common. He was concerned, though, that “America was as unprepared for peace as she had been for war” and that if a spirit of vindictiveness prevailed at peace talks, the great suffering on both sides would have been for nothing. As an ambulance driver Kirkland knew intimately the human suffering caused by war, and was “not anxious for another war.” He considered the ideologies at stake and ultimately agreed with Wilson that fighting “a war to end all wars” was justifiable. Kirkland, however, lived to see WWII. After completing his PhD course at Harvard, he taught history for many years at Bowdoin College. Written by Ellen Nye '14. Ask for Rauner Alumni K635l. 1Joseph M. Larimer, “Voice of the People.” The Dartmouth: November 9, 1915. 2Kirkland, Edward C. Letter to his parents, June 3, 1918. The Letters of an Ambulance Driver. Rauner Special Collections Library, 1919. 4Kirkland, Edward C. Letter to his parents, July 1, 1917. The Letters of an Ambulance Driver. Rauner Special Collections Library. 5Kirkland, Edward C. Letter to his parents, June 24, 1917. The Letters of an Ambulance Driver. Rauner Special Collections Library, 1919. 6Kirkland, Edward C. Letter to his parents, July 1, 1917. The Letters of an Ambulance Driver. Rauner Special Collections Library, 1919. 8Kirkland, Edward C. Letter to his parents, February 1, 1918. The Letters of an Ambulance Driver. Rauner Special Collections Library, 1919. 9Kirkland, Edward C. Letter to his parents, January 11, 1918. The Letters of an Ambulance Driver. Rauner Special Collections Library, 1919. 10Kirkland, Edward C. The Letters of an Ambulance Driver. Rauner Special Collections Library, 1919, “Dear Ma and Pa,” February 17, 1918. 11Kirkland, Edward C. Letter to his parents, November 13, 1918. The Letters of an Ambulance Driver. Rauner Special Collections Library, 1919. 13Charles Wood, The Hill Winds Know Their Name: A Guide to Dartmouth’s War Memorials. Hanover N.H.: Dartmouth College Office of Public Affairs, 2001, 6. Published on September 16, 2014 September 17, 2014 Author Rauner LibraryLeave a comment on A War to End All Wars: "Necessary, Just & Righteous"
Published on September 16, 2014 September 17, 2014 Author Rauner LibraryCategories Rauner Special Collections LibraryTags Dartmouth History, Special Collections, WWILeave a comment on A War to End All Wars: "Necessary, Just & Righteous"
"September 16, 1917, Sunday, Fair. Soldiers load lumber for field artillery positions into a supply truck. Fourteen camions [supply trucks] were called at 4:15 so at 5 we pulled out to load at B. for a 12 1/2 hour trip. We carried ammunition and lumber and left it at a new park. It is evident we are advancing for from time to time we are pulling forward. Today we saw some real sights. At one place where we stopped we saw a big sign painted in white over the front of a big factory with now only a wall standing, bearing the words "Gott strafe England 1914-15." This shows how bitter the Germans are. At a point near here, we were sitting down under a tree eating our supper when we heard a terrible bang at the north of us, followed [by] a whistle of a big shell right over our head and about 5 seconds after we heard it land and explode throwing up a cloud of black smoke. Later we heard this was the first of several shells which were "set upon" Soissons. The city is terribly ruined now so I don't see why they want to do any more smashing of splinters. We were on the road just 12 1/2 hours today so when we got home, I was some tired, believe me." Chipman 1919. Ammunition truck driver with American Field Service--French Army on "Chemin Des Dames," June 1917. John Hale Chipman was a Dartmouth alumnus who interrupted his education to serve during the Great War, like so many others of his era. 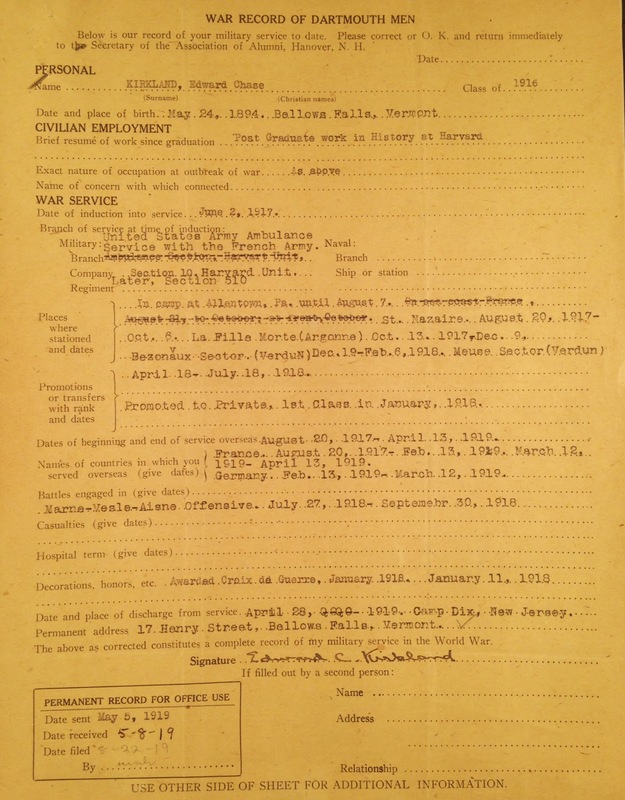 A member of the class of 1919, Chipman enlisted in Hanover in the spring of 1917. By early June, he was in France and driving a munitions supply truck for French artillery, despite initially signing up as an ambulance driver. Over the course of the next two years, Chipman would serve in France, Italy, and Belgium before receiving his discharge papers on March 21, 1919, at Versailles. The entries that follow represent Chipman's faithful daily communications about his experience in the war from September 16 until November 17 of 1917. We will post one entry per day from Chipman's letters, along with a photograph from his album, and march through his experiences with him, nearly a hundred years after he first recorded them. The first entry below, although not chronologically in synch, outlines Chipman's scheme for recording his experiences, and also sets the stage for when we take back up with him nearly three months later, on September 16th, 1917. You are undoubtedly wondering what has become of me and where I am, and also what I am doing. Well, I'll tell you in diary form. Each day I will write my diary and mail it to you probably twice a week. And, I would write you individually if I could but I am going from 6:00 A. M. till 10:00 P. M. daily. I left new York June 2nd after Breck saw me off and I started talking French right away. Our boat was an old tub but accommodated some 200 boys. But the particulars of the boat you will receive shortly as I mailed you two letters from Bordeaux, June 12th. We embarked from the boat and marched up the main street of Bordeaux and arrived a la gare (at the railway station) where we were given instructions. We broke ranks at 2:30 and were told to report at 7, so we walked around the town sight-seeing, and we were almost blinded by the queer sights. We first noticed the monotonous grey color of the square four-storied buildings. Most of the buildings had iron-grilled balconies and figures designed and cut in the top corner stones of each building. We saw very few men and they were in uniform, but three women out of four were dressed in black signifying that they had lost a husband, father, brother or son in the cause of France. And so with many wounded,--if you offer words of pity, you receive an earnest reply of,--"C'est la guerre," or "Pour la Patrie". All the people I talked with were very interesting, wanting to know all about America, when our armies were coming, etc.--and they were very emphatic in making known that they were heart and soul for America. "Vive l'Amerique! ", their greeting and parting word." A War to End All Wars: "Dying for a Cause"
Merrill’s love of English literature extended to all people and things English. He occasionally referred to the English as “his countrymen” and admitted, “I like England very, very much. I could easily love it as a home, and it is surely greatly worth fighting for.” After the British had endured two years of combat, Merrill decided that he could no longer continue drilling and waiting. He left his home at Cambridge in November of 1916 to volunteer as a gunner in the Canadian Field Artillery. Only eighteen, he was considered a minor by the Canadian military, and his father did not consent to his involvement, so Merrill assumed the false name Arthur A. Stanley. In a letter home to his father, Merrill explained that he “could not, in honour, stay out if America should take no action.” So, Merrill’s great love of all things English propelled him into war and he soon found himself on his way to England. From November 1916 to October 1917 at a training camp in England, Merrill was instructed specifically on operating the 8-inch Howitzers, massive guns fired from far behind the front lines. During his adjustment to military life in England, he decided that saying “Cheerio” was the best cure for war gloom. When on leave, he explored the English countryside and overstayed his leave of absence several times. Finally he was placed in “the clink,” a solitary cell, as punishment for absence without leave. Merrill was unperturbed though, and simply brought his large collection of reading material with him: Shakespeare, Tennyson, Canterbury Tales, Vergil’s Aeneid I-VI, Wilhelm Tell, The Golden Treasury, Pickwick, poems by Rudyard Kipling, French, German, and English Dictionaries, the Daily Telegraph, Horace, The Iliad, and Don Quixote. He also penned a short poem titled “Ye Ballad of ye Clink” while confined. It's mighty hard, Ed leaving everything back there, perhaps for good and all. So if it should be that, friend, I'll say good-bye—but God! how can one—a couple of simple words and it’s over, and you go up to the Line, and try to laugh, or smile at least, and swallow it down. But it's part of the game, of course, and it is a noble end which we seek out of the ruck and jetsam of death and broken men and lasting sorrow. Merrill died when he had just begun to experience the realities of war. He never wrote regretfully about his decision to join the military, and as this passage shows, he considered dying in the war “a noble end.” Wainwright Merrill was one of the many young, good-humored, and idealistic men whose lives were ended prematurely by the war. Ask for Rauner Alumni M5525c. 2Wainwright Merrill and Charles Miner Stearns. A College Man in Khaki, Letters of an American in the British Artillery. New York: George H. Doran Co, 1918, vii. 3Merilll, Letter to Charles Miner Stearns, his English professor at Dartmouth, November 5, 1917. 5Merilll, Letter to his father, June 29, 1917. 6Merrill, Letter to Mrs. Clark, August 18, 1917. 7Merrill, Letter to his father, November 2, 1917. 8Merrill, To Edward Hubbard, October 28, 1917. 9Charles Wood, The Hill Winds Know Their Name: A Guide to Dartmouth’s War Memorials. Hanover N.H.: Dartmouth College Office of Public Affairs, 2001, 6. Published on September 9, 2014 September 12, 2014 Author Rauner LibraryLeave a comment on A War to End All Wars: "Dying for a Cause"
Published on September 9, 2014 September 12, 2014 Author Rauner LibraryCategories Rauner Special Collections LibraryTags Dartmouth History, Special Collections, WWILeave a comment on A War to End All Wars: "Dying for a Cause"
Published on September 2, 2014 September 4, 2014 Author Rauner LibraryCategories Rauner Special Collections LibraryTags Dartmouth History, Special Collections, WWILeave a comment on A War to End All Wars: "Not the Gay Life You Would Have Imagined"